A day after the election of a new pope, the only pope in the bracket, Gregory the Great, digs in his (red, Prada-covered) heels against Florence Li-Tim Oi, the first female priest in the Anglican Communion. To make it to the Saintly Sixteen, Gregory defeated Martin of Tours and Florence bested, nay demolished, Chad of Lichfield in our most lopsided match to date. Today’s winner earns a date with Oscar Romero in the next round. Yesterday in heart-thumping fashion, Frances Perkins upset Martin Luther King, Jr. Yes, you read that correctly. The first female cabinet member will now face Jonathan Daniels in the Elate Eight and we’re reminded, once again, why this is called Lent Madness. While the heated battle was going on, Tim spoke about the world’s most popular online Lenten devotion, on Boston Public Radio. You can listen to the live interview (well, live at the time) by clicking here (skip to 1:35:15). 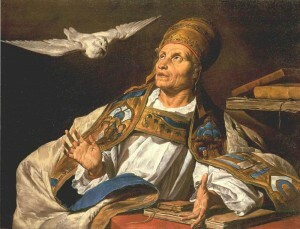 A liturgical reformer and staunch advocate for the poor, Gregory the Great, pope from 590 until his death in 604, skillfully navigated the complex era poised between the ancient and the medieval world. Drawn from his love for the quiet, monastic life to be pope, he served the church and the people of Rome faithfully. Now, despite 1,400 years of being maligned, Mary Magdalene seems to have had the last laugh. She has universal recognition while we don’t even know poor Gregory’s last name. And, some might remember, she fared pretty well in Lent Madness 2012. But this isn’t something about Mary. O how good is charity, which through an image in the mind exhibits what is absent as present to ourselves, through love unites what is divided, settles what is confused, associates things that are unequal, completes things that are imperfect! Rightly does the excellent preacher call it the bond of perfectness; since, though the other virtues indeed produce perfectness, yet still charity binds them together so that they can no longer be loosened from the heart of one who loves. And this: “The proof of love is in the works. Where love exists, it works great things. But when it ceases to act, it ceases to exist. But what about the dove? [W]hen the pope was dictating his homilies on Ezechiel a veil was drawn between his secretary and himself. As, however, the pope remained silent for long periods at a time, the servant made a hole in the curtain and, looking through, beheld a dove seated upon Gregory’s head with its beak between his lips. When the dove withdrew its beak the holy pontiff spoke and the secretary took down his words; but when he became silent the servant again applied his eye to the hole and saw the dove had replaced its beak between his lips. Remarkable indeed is his own discriminating insight, displayed throughout, into human characters and motives, and his perception of the temptations to which circumstances or temperament render various people—pastors as well as members of their flocks—peculiarly liable. No less striking, in this as in other works of his, is his intimate acquaintance with the whole of Holy Scripture. He knew it indeed through the Latin version only; his critical knowledge is frequently at fault; and far-fetched mystical interpretations, such as he delighted in, abound. But as a true expounder of its general moral and religious teaching he well deserves his name as one of the great Doctors of the Church. 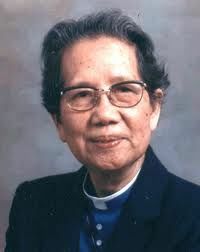 Florence Li Tim-Oi, first female priest in the Anglican Communion, pursued a theological degree in Guangzhou during the Sino-Japanese War. In between exams, she also headed up the rescue squad, searching for survivors each time her town was bombed. Her memoir details the horrors she viewed: the girl crushed beneath rubble, the woman with bound feet who couldn’t flee, the man blown apart. This turned Florence into a permanent lover of peace. The fisherman ordered all of us to throw the fishnet overboard and pretend we were trying to pull the net in. All the passengers co-operated. Knowing that I was a missionary, they jointly urged me to get below deck and pray. I gladly obeyed and knelt down in sincere intercession, imploring God to show his mercy…and grant us peace which passes understanding…Thinking that we were merely poor fishermen with no profitable booty, the bandits turned and sailed away. She got her father out safely, but discovered later that the other boats that had left with them had all been captured. 108 Comments to "Gregory the Great vs. Florence Li-Tim Oi"
In recognition of those women who in our lifetime will never become the Bishop of Rome in the Catholic Church, I vote for Florence over the Pope Gregory. I small act of rebellion, but it’s my act of rebellion. Thank you, Lois, or inspiring my own small act to do the same! “I knew that having been ordained, I had to follow the order throughout my whole life. This is my philosophy of life. No one can take away the peace that comes from completing one’s responsibility to history and fulfilling God’s will.” Amen. I cannot vote for the Pope who conflated Mary Magdalene with the woman caught in sin, thereby sullying one of the great women of the Bible, and removing a great female role model for centuries. This was a serious blunder, whose consequences we continue to struggle with today. I keep reading comments like this, but really, unless we’re still enmeshed in the way the world sees things, is it “sullying?” Why would a repentant prostitute not be a role model… God saw fit to see that a prostitute was one of Jesus’ female ancestors, after all. Florence was new to me, but she speaks volumes to me about physical and spiritual courage, about wisdom, discernment and faith. I agree! Flo it is. Seems the biographies were a little uneven today – for someone as remarkable as Florence Li-Tim Oi we need to know more! I agree, but thought the biography of Gregory critically lopsided. Ditto what Lois said. I hope we can make a statement today. First, I am FLABBERGASTED that MLK did not advance!!! Lent Madness, indeed! Second, this one is a no-brainer for me. My father was a child when the Japanese invaded China; my grandmother had bound feet, making it hard to flee with a bevy of small children. That Florence Li Tim-Oi (Li is her last name, Tim-Oi was her given name — put the hyphen in the right place, y’all!) became a lover a peace and kept her faith, when many would just become hardened and vengeful, is an inspiration to us all. Florence! Absolutely! Love her comments about following her ordination even. If she had to give up the title! And thanks to her celebrity blogger for a story that makes me want to hear more! No contest here….anyone who isn’t a friend of Mary M. is not a friend of mine. Besides I admire Florence Li Tim-Oi tremendously for her courage and faith. I agree the bios are a bit uneven today, but Heidi, whose side are you on anyway, all that negativity on old Greg? For or on Ms Li, check the Round of 32 post, though maybe even that is scant. Suffice it to say, such a heroine has it all over old Greg, all he did was pope, nothing against the flow of human error. After all the comments about the 591 sermon in the first round, I figured it would be important to mention it. First rule of public relations: be the first to frame the controversy. It swayed my vote for Flo… Who good vote for the man who tarnished last year’s Golden Halo winner. Amusing to see the word ‘pope’ used as a verb. I, too, voted for Florence. Even though I would normally support the person Heidi writes about (after all she is my neighbor) I am going with the admirable Florence. Thanks, Amelia. Hey, are you up for Mad Men on the big screen? It starts in early April, I think. “Intimate acquaintance with the whole of Holy Scripture” and living in the tension between a life of monastic order and the call to larger ministry — Gregory’s got my vote today, but this is another very close call. The more I learn about Florence Li Tom-Oi, the more deeply impressed I am with her humility and strength. “Tim-Oi” — autocorrect don’t know from saints! Gregory was Great, but oh, that Flo! I can look past his Mary muck-ups and admire Gregory’s generosity and contributions to liturgy, not to mention his communication with doves. But when I read of Florence’s lifelong bravery, humility, faith, and love, I get stingies in my eyes. She not only survived brainwashing and lived as a secret priest–she saved her dad from pirates! I am so glad Lent Madness has introduced me to this remarkable woman. Let’s hear it for humility, faith, hope and love – not to mention perseverance in the face of great adversity from both without, and within, the church. Got to go with women priests. It is too soon for Florence to be considered for a “golden halo” . It hasn’t been fifty years since she died. In this time in history, eligibility could be tied to the history of color photography. If a color photograph exists (see above), it’s too soon. Lent Madness should be more historical, not political. Did you know that if you read Butler’s Lives of the Saints, there are many saints for every day in the year? What were the ferrets thinking on this one? Lent Madness will be around for years, I’m sure. Ten years down the road would have been a good choice for Florence. And Frances Perkins too should have been out of contention! I agree, and said so when she was first proposed. And even MLK,Jr isn’t quite up to the usual 50 year mark yet. Then so should MLK have been out of contention, as he hasn’t been dead for 50 years either. As a singer and choral conductor, I leaned toward Gregory the chanter, but as a female clergy (United Methodist) who was the first female to serve both parishes to which I was appointed, followed by 15 years of hospital chaplaincy, I had to go with Flo. I’m learning so much from this site! Hey, Sr. Lucy! I had something of the same quandary, but in the end felt I had to support Rev. Flo. I’m disappointed, however, that this biography doesn’t mention that her given name in Chinese means “beloved daughter,” and was given to her by her father to show that he was as proud of her as most Chinese fathers are of their sons. I now use Florence as one of the spiritual “she-roes” of my new women’s spirituality seminar, “Blessed Is She.” I’m learning more about her all the time. Gotta be Flo. Someone said, “Gregory was simply a product of his times. You can’t blame him” Sorry, but that fly just don’t float in my stream. Not judging, just saying. Off to the library and Web to find more “Li” info. As my seminary class (Berkeley, ’09) commissioned an icon of Mother Li that hangs in the chapel and that I gaze on most mornings, my vote must be there as well. Thank you, Mother Florence, for the lessons in humility and courage. Come on, Berkeley Divinity School, vote for Joe’s favorite Holy Woman!! I knew this would be a total blow-out! Seems like Gregory’s CB wasn’t even sold in him! Beautiful Florence will go far! Glad I learnt about her though! Never knew anything about her till Lent Madness. If you poke around Amazon, you should be able to find a used copy for less. I agree, it is tragic it is out of print. Maybe it’s time one of the writers among us wrote a new biography of Rev. Florence. Wouldn’t that be cool? isn’t a feeling. It’s an action.” Echoes of St. Gregory! Lois Keen has stated it well. Also, Florence Li Tim-Oi was the Vicar of Christ, as are all of the baptized, the representatives of Christ on earth. We will pray for the new Bishop of Rome today as we celebrate the Holy Spirit working through the life of Florence who said, “Here am I, Lord. Send me.” Her “yes” was not to power , control, privilege, nor worldly fame. Perhaps her life will be an example to our brother in Christ, Francis I.
I am surprised that Martin Luther King Jr. lost. Yes it is Lent Madness. I sincerely hope the SEC will bring Dr. King back next year. Today another difficult choice but today “Be not anxious about what you have, but about what you are.” Therefore I vote for the underdog Saint Gregory. I am voting for GtG and here’s why:1) Flo-O is going to win anyway 2)”through love unites what is divided, settles what is confused, associates things that are unequal, completes things that are imperfect!” Since i am in pre-official discernment for ordination, i feel like i need that tatooed on my arm! 3) Remarkable is his own discriminating insight iinto human characters and motives, and his perception of the temptations to which circumstances or temperament render various people—pastors as well as members of their flocks—peculiarly liable.” Oh Gregory, how the shepherds of all churches could use your guidance… and: 4) “The proof of love is in the works. Where love exists, it works great things. But when it ceases to act, it ceases to exist. 5) He loved (and maybe did very badly, as in the case with my beloved MM) to use typology as a method of finding truth in the Bible. Nothing wrong with that, all of scripture is deliberately filled with it “the new Adam”, “a new creation”, the Magnificat, the 40 days in the wilderness and on, and on, and on. A vote for typology! Since he will lose, I suppose I will have to research these “liturgical tinkerings”. I love liturgy, so that can be good or bad, depending on the innovation! Voting for Flo here. We stand on the shoulders of the giants who came before us and she was certainly one of them. As a priest who happens to be a woman I am so grateful to her for blazing a trail. I am still in shock about MLK not advancing. That is what makes Lent madness…..Mad. goes on …..Today You GO FLO….all the way. Oh well, it seems this year’s lent madness is favoring the women. That is not a bad(or mad) thing! I will not mount a campaign to solicit votes for my namesake. Still voting for Gregory the Great. My vote is for the Rev. Florence, the inspiration for all Episcopal ordained women. It is interesting to note those amazed that MLK didn’t win….really? Also amazed at those who think it’s too early for anybody whose bones haen’t been moldering in the grave for centuries to even be in the LENT MADNESS contest…. MADNESS is a qualifier, remember? And all in a joyous spirit…comprende????? Get a cuppa Joe in your 2012 GOLDEN HALO/Mary Mags cup and chill out! Florence for sure. An easy vote for me today. Her faith in God’s call and her willingness to serve the church in the world, even when her orders were “recalled”, her certainty that God had a purpose for her (and as someone else said, in hopes that one day there might be a Pope Frances as a result of Florence and other women who haven’t given up on the church), I honor Florence today and thank God for her witness. Absolutely no contest. Florence is most definitely the one today. Florence for me. I love Gregory, truly I do. But Florence’s insistence on being faithful to her orders … That’s the model for me. And pirates! She defeated pirates! Finally, a day in which I’m not agonizing over my vote! I’m just sayin’ “Nope to the Pope” and voting for faithful, fearless Florence. (could have gone with Johnny Depp, but going to see a local production of “PoP” tonight at the Carolina Theatre. Hurrah for the Pirate King! Yippee skippee for Kevin Kline! And Yo-Ho-Ho and a hearty huzzah for the faithful Florence! Sounds like what she really was was a missionary to Canterbury. In another age, that might have got her a front row seat at a bonfire. Love the Anglican connection–Gilbert and Sullivan! And while I would happily run a Kevin Kline film festival, the best version of Pirate King has to be Jon English’s. Link here: http://www.youtube.com/watch?v=fLrKJV4ITeE. Production values are horrible but this is the funniest thing. Jon English became famous playing Judas in Jesus Christ Superstar–another Biblical figure who will never appear in Lent Madness! The voting here is obviously loaded with “femmy” dedicated diehards, and poor Gregory doesn’t have a chance, even with the coincidence today of the new Pope with Jesuit background. One vote here for “fair and balanced” encouragement for bracket advancement. I agree, and I did voice my concern over the too recent people put forward in this year’s Lent Madness. No one who has been dead less than fifty years should be put forward. There is too much polarization going on. Indeed, it looks as if at least three individuals will go forward who aren’t even recognized by the national church yet. This is weird. But they are in Holy Women, Holy Men and I believe that was the stardard that the SEC chose to use. It really is called Holy Women, Holy Men . . . you can find it online or I’m sure Forward Movement would sell you a copy. While I am not sure what standard the SEC used if Holy Men, Hole Women or proposed additions to LFF the standard might be a bit low. I mentioned in a post a few days ago that Derek Olson has compiled data on the progression of “named” persons for commemoration in the Episcopal Church. During the period between 1957 to 2008 roughly 100 individuals were proposed for an average of 2 per year. During the period between 2008 and 2011 roughly 127 individuald were proposed for an average of 42 per year. Either the church has suddenly discovered a previously unknown pool of “saints” or we are as a church engaged in a headlong rush to create “saints” resulting inevitably a dilution of the quality of named individuals. I know that Lent Madness requires no particular rhyme or reason for casting a vote for a particular person. That explains how a person who was probably simply a legend got more votes that John the Baptist. It also explains how the unknown author of Luke/Acts defeated John Donne. It even justifies the vote today where people cast votes as they stated in their comments to send a message to redress wrongs done to a particular group of people in years past. Many of you do this for fun and that is both proper and fine. Some of us try to seriously try to learn about saints and candidates who never existed, never wrote the texts that they are famed for or who gain support as a political statement are troublesome for some of us. Please do not chastise me for being too serious since I know this is just a game. I am sorry if I seem critical and I mean no offense to any of you because I do not doubt your love and sincerity. However there is a difference between Lent Madness and Lent Silliness. “femmy dedicated diehards”? I can’t tell you how much I hope this is meant to be humorous. I am with you – that is the overt feminist polarization is rather evident in the voting today as it was in the biographies. Can we get the hyphens consistent? Li was her family name, Tim-Oi her personal name. In Chinese style, the last shall be first. She took Florence as her Christian name, placing it Western style in front of her family name. Hence, the mixed style of Florence Li Tim-Oi. My mother-in-law, roughly Li’s contemporary, used the same mixed style: Constance Ip Yik-Chi. The Episcopal college chaplain in my long-ago college days was originally from England and had been a missionary to China before ending up in California; it was from him that I first heard about both Frances Perkins and Florence Li. He clearly approved of both, although I don’t recall that he thought of Li’s ordination as anything other than an emergency measure. He and his wife are two of God’s obscure saints, those who lived quietly Christian lives without fanfare. Got to go w/t Flo!! That memoir description of pirates/father’s rescue..Wow! Flo had creative courage, strength & faith!!! Thanks Megan Castellan!! There are going to be some very difficult choices to be made in the Elate Eight. Florence all the way! My son lived in Guangzhou and Macau for one year each while serving as a missionary. There was no other choice for me. What’s with Greg and the Dove? He must having been using his teeth to keep the ‘beak between his lips’. That’s just way too weird! But O! that Flo: “No one can take away the peace that comes from completing one’s responsibility to history and fulfilling God’s will.” She’s the Great one! Still shocked that MLK lost. Voting for Gregory just to be contrarian. Bless your hearts! Why all the kvetching and nit picking? I see the results not so weird as mad! Hence the name of the game. Also, let’s hear less legalism. “Not eligible until dead 50 years” and so forth. 1. Hear hear! Saints of old can be inspiring, but I like ’em fresh, too! 2. Followers of the One who said, “But many who are first will be last, and the last will be first” can’t complain too much about LM voting results that are contrary to expectations! 3. Is it a sin to be relieved when a heavy-hitter is eliminated, so the decisions later on might be easier? I was not looking forward to discerning between Romero and MLK Jr. , powering towards one another from opposite sides of the bracket. i agree; as if they develop saintliness posthumously, or have to be aged like scotch to be holy…. i’m sorry; MLK was a saint and i don’t care what anyone says! The story of Florence rescuing her father is what swayed me — this was a woman who wasn’t afraid of ANYTHING and who accomplished the Lord’s work despite blockades, bombings, pirates, and church controversy. Had to go with Flo. Learning much in this exercise, We knew a Priest that was taken prisoner by the Japanese in the Phillipines and survived, barely, he endured much abuse. Rev. Flo gets our vote, but as is typical with this madness, both are very deserving and Christ bearers for us to admire and emulate. Thanks for including this part, Heidi: His point — to prove that even a person deeply mired in sin could be redeemed by the work of Christ — is mostly lost within the controversy. He said, “In paradise, a woman was the cause of death for a man; coming from the sepulcher, a woman proclaimed life to men.” Quite a statement, that. I would certainly be happy with Flo, though…. Hmmm. I think we may have way too many news junkies among us who stayed up too late last night watching all the Pope Francis commentary and are today very cranky as a result. Myself included. I’m just too deeply influenced by my own family history that includes a little Asian girl who likely would have ended up devalued on the streets of Seoul instead of chasing the Broadway dream in New York that she now is had it not been for my mother’s and stepfather’s selfless act of love more than 25 years ago. It’s Flo for me! Florence gets my vote today. Florence was not just a woman priest. Florence was a priest doing what all priest’s do bring God’s vision, bring God’s healing, and bring God’s community to earth for God’s people. I am in mourning that MLK didn’t win, so I am voting for Florence partly for his sake: because she was another soul who stuck out her neck, not for her own sake, but for God’s. To me, this is what saints are for — to point us to Christ’s example. I have no doubt that Gregory “built the church” more than Florence, but Florence is the more saintly. I have only just met Flo for the first time today, but I look forward to learning more about her. Those who are kvetching about Gregory’s dissing of MM (and I agree, that was mistaken and troublesome) should have taken the trouble to finish that paragraph in the blog: “His point — to prove that even a person deeply mired in sin could be redeemed by the work of Christ — is mostly lost within the controversy. He said, ‘In paradise, a woman was the cause of death for a man; coming from the sepulcher, a woman proclaimed life to men. '” To me this is a strongly positive statement about MM that largely overcomes the blunder. I have been aware of Florence for many years, and have develoed a real respect for her this Lent, but even though I voted for Martin Round I it is Gregory this time — he did after all help plant one of the trees which intertwined with the Celtic one to produce English Christianity. I guess we’re just all a bit Poped out. Silly me, I thought “the Great” was the Pope’s last name, like Winnie-the Pooh. My mixed feelings about popes who stand on the threshold between one age and the next (as GtC did and Francis does) weighs heavily in the balance, so I’m going with Florence. Good for you, Megan, for finally getting the hyphen in the right place in Florence’s Chinese name! That’s been bugging me! And despite ties to St. G’s parish, the brave and humble lady has my vote. Had to stick with Florence again! Gregory was Great, so is Heidi’s write-up, and I love the dove. c) because of the shining rightness of her example, calling the Church forward into recognizing that gender is no barrier in God’s call to ordained ministry. I think that it is very important, in our modern lives devoid of so much mystery, to recognize the modern saints that inspire us. To recognize them, we need to KNOW about them, and frankly, other than MLK, I have known about very few of these people, and I’ve REALLY enjoyed learning about them in the context of our better known modern history. And hello? Didn’t CS Lewis win the 2011 halo? As Tim keeps saying, that’s why it’s Lent MADNESS folks! I’ve enjoyed learning about Gregory; despite being raised Catholic, I really didn’t learn much about the saints. Probably had something to do with my CCD teachers being Flower Child Jesus Freaks. I can forgive him for the Mary Magdalene thing; as someone else pointed out, isn’t the concept that she _could_ have been a prostitute and still have been one of Jesus’ most faithful followers part of the good news? I still admire his answer to the call to Pope despite that not being his ambition. However, he just can’t beat the charisma and humility of Florence Li Tim-Oi. Oy! Go Flo! So delighted to see that Flo is making a stellar showing. To the final round! My pick for the Golden Halo. The pace of adding names has picked up recently because so many were left off before, e.g., Harriet Tubman, Sojourner Truth …. that is kind of the point of Holy Men, Holy Women. I assume the pace will slow down again once we are through this phase. It’s great to have a chance here to learn more about some of them here in this fun, dare I say mad, setting. I love learning about the modern as well as ancient saints. Reminds me of that old Sunday School hymn–and one was a doctor, and one was a priest …. and I mean to be one too. I would also like to take (gentle) offense to this idea that the only role of some of these saints are about “political statements.” It was especially interesting to me that Frances Perkins has been portrayed as a political radical–or worse, a “politician”–whereas Martin Luther King is not. Both were certainly vilified for being radicals in their times. Arguably Martin’s politics at the end of his life were more radical than hers, in terms of how he was opposing the Vietnam war and calling for solidarity of the poor across the world. And let’s not forget that his last action in life was to accompany municipal sanitation workers in Memphis in their struggle to be recognized as an AFSCME / AFL-CIO union–surely Frances would have approved! But in the context of this Lent Madness, what has moved me has been the description, as best we can do it, of faith put to the test. The test of a martyr such as Martin Luther King is well-known, and deserving of being known and remembered. Deserving of the Golden Halo, too. Frances though is also an inspiration to me–someone who carried out direct social work but also found a way within a very hostile and resistant bureaucratic system to be a conscience to the politicians over decades. It cannot have been easy to stay focused. I’m sure that’s one reason why she took so many retreats with the sisters! We need people like Frances who have this patience and fortitude. And she didn’t just make political statements. In fact, she never ran for office, never had those accolades. But it is more than a little dismissive to say that what she did was political statements. Mostly, she worked behind the scene–and she got it done! It took decades to limit child labor. Decades to get workers’ compensation for injuries on the job. Decades to limit working hours (ultimately) to 40/week. Decades to get some kind of social security so that our elders–which is most of us, eventually–could have a dignified old age. She was the force behind these. FDR was ready to let a lot of it go in the face of political realities and opposition and an unstable coalition. She persisted. Not for personal gain, but for all of us. That’s saintly! If a little mad, which I think all of these folks have had to be …. Learning a lot from the Comments – one of the many blessings of LM. Thanks for these thoughts! Such a great discussion today! The best and the worst part of LM is the question: Would I have done as the saints de jure did? The follow-up question: What have I done for God lately? So, anyway, today I vote for Florence because I can relate to her, at least a little, and I have a hard time getting into Gregory’s mindset. Very flimsy, I know. Really enjoyed hearing Fr. Tim’s BPR interview! I somehow missed the vote opportunity for Gregory the Great, so I’ll express my support by saying that his writings helped me write an A+ paper in graduate school on the poem, “Piers Plowman.” Blessings to all!